Preheat oven to 190 °C. Place cupcake liners in a cupcake pan. Sift together the flour, baking powder and salt on a sheet of parchment paper. 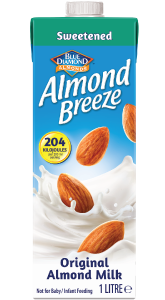 In a small bowl or measuring glass, combine Almond Breeze, vanilla and almond extract. In the bowl of a standing mixer, beat butter until creamy. Add 1 cup sugar and beat on high speed until fluffy. Add the flour mixture in 3 parts, alternating with the Almond Breeze vanilla mixture and beating on low speed after each addition. Move this mixture to a large bowl. Wash the bowl of the standing mixer, drying well to ensure no moisture or grease remains. Beat egg whites and cream of tartar in the standing mixer until soft peaks form. Gradually add remaining ⅓ cup sugar, beating on high speed, until peaks are stiff but not dry. Use a rubber spatula to fold ¼ of the egg whites into cake mixture in the large bowl. Then fold in the remaining egg white mixture until batter is well combined. Fill each cupcake liner halfway with batter and bake for 5 minutes. Remove from oven and lightly place prepared almond paste (teaspoonfuls rolled into balls) atop each cupcake, centered. Top with batter so the liner is 2/3-3/4 full. Bake until a tester comes out clean, 15 to 18 minutes. Allow to cool in the pan for 10 minutes, and move to a wire rack to cool completely. Prepare frosting and Sugar-Coated Almonds. Frost cupcakes and sprinkle with almonds. Serve. Whisk together ingredients except vanilla extract in a large stainless steel bowl. Set the bowl in a wide, deep skillet filled with about 1 inch of simmering water. Make sure the water level is at least as high as the depth of the egg whites in the bowl. Beat the whites on low speed of a handheld mixer until the mixture reaches 60 °C on an instant read thermometer. Do not stop beating while the bowl is in the skillet, or the egg whites may overcook. Beat on high speed for 5 minutes. Remove the bowl from the skillet and add vanilla extract. Beat on high speed for 2 to 3 more minutes to cool. Use within a few hours. Serve any leftover frosting as a dip for fresh fruit. In an ungreased baking pan, roast 3 ½ cups sliced almonds at 190 °C for 10 minutes, turning pan and stirring halfway through baking time. Bring 1 cup sugar and 2 cups water to a boil in a large pan; add almonds and stir. Sugar with crystallise; keep stirring and then it will caramelise; remove from heat and spread almonds onto a baking sheet lined with parchment paper. When cool and dry, break up and sprinkle on top of cupcakes. Store any extra almonds in an airtight container. They are great for snacking, in popcorn or as a topping for ice cream.